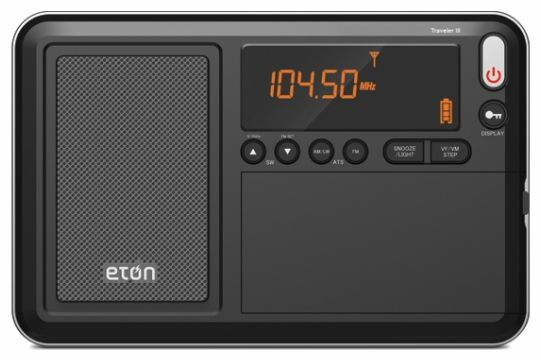 Passing through Phoenix, Arizona last April, I stopped into one of those Radio Shacks that were closing and picked up the new Eton Traveler III DSP radio for about $45 out-the-door. Not a bad price, near 40% off suggested retail of $69.99. I've spent the summer evaluating it, and had a chance to use it while crossing the country. The last couple of DSP radios I bought were disasters so I quit buying them. The Tecsun R2010D and the Kaito KA321 both had odd tuning quirks, seemingly a product of their engineering. Quality is generally down these days. Sensitivities are generally poor. I gave both radios away at a yard sale two summers ago, then decided to take a hiatus from buying Asian consumer DSP radios until something changed, or someone reported an improvement worth looking at. In a radio, I only care about a few things. Mainly, but not limited to: does it have reasonable sensitivity and selectivity, does it tune acceptably well, and does it have a readable display? I don't care about jillions of memories, ETM, alarms, sleep timers, or temperature display. Just give me a radio that receives stations. My old 1962 Sears Silvertone seven-transistor radio, "ice blue", received stations, and well too. Elementary silicon technology, it was. If they could do it some 53 years ago, they can do it now. And so we have the Eton Traveler III. Not perfect, but promising. I bought it for two reasons. People had reported that the annoying soft-mute (see other DSP radio reviews on this blog) had been disabled or at least minimized, and that the radio's sensitivity was pretty good. The 'Traveler III is basically the next iteration of the original Tecsun PL-300WT, and Eton's Grundig G8/Traveler II offering of several years ago. It uses the new version of the Silicon Labs' Si473x chip. The Eton Traveler 3 (I'll use the number 3 from here on out), is small, basically pocket-sized, but has some heft to it. It fits well in your hand. It is a beautiful little thing to the eye, and it's got a nice build quality. The sound out of its ample, front-facing speaker is pleasant. The Eton engineers have nailed three important things on this unit: smoothness in tuning for a DSP radio (though points off for poor tuning encoder), defeat of soft-mute, and sensitivity. They have also failed in three categories: the tuning encoder, the AGC (automatic gain control) setup, and the display. Ahhh, smoothness in tuning. Fond memories. As an old radio "Ham" and general DXer, I've been tuning receivers for more than 50 years. Memory drifting.... Slowly we sweep across the band. Vibrant, reverberant (somewhat microphonic) signals rise up out of the ether, then smoothly fade away under the noise as we pass by. Pure magic. Think of zeroing in on Radio Moscow on a cold winter's morning in about 1960, announcer Joe Adamov booming in on a late 1930s vacuum tube Zenith stand-up console radio. Analog tuning, the old superheterodyne, the smoothest of the smooth, seems to only exist in some cheap consumer pocket varieties now, many of them hold-overs of best-selling consumer items of 15-20 years ago like the Sony ICF-S10MK2, the Sony SRF-59, still on sale at your local drug store. And there are others of course - newer, cheaper, Asian analogs. Digital PLL (Phase-Locked-Loop) radios are still with us, introduced on the public many years ago. They tune adequately, although exhibit a sort of lack of "presense", a hard sensation to describe. Enter the consumer digital DSP chip world, circa 2009. It was (and still is) promising. But we seem to have gotten away from smooth tuning. Consumer design teams have struggled getting it right with these new Silicon Labs DSP chips for some reason. I was starting to believe it wasn't possible. After several years of using these radios, it started to become evident that soft-mute was the main culprit here. Combine soft-mute with oddly-set AGC characteristics, then couple that with the DSP chip's odd infatuation with peak AM signal-lock and you have a recipe for tuning weirdness. Soft mute, which is programmable, has finally been turned off in the Eton Traveler 3. No more muting of noise next to a strong (or weak) station. No more dead air where there is no station. Only the beautiful, low-level hiss of the noise floor and the resounding crashing of the ionosphere. Wait - I hear a carrier and faint audio under that hiss. I am back in 1962 once again! Sweet! The soft mute change - its elimination - promotes smoothness of tuning, at last. Signals don't just "pop in", ala TV remote control. They rise and fade, nearly like the old days, as you sweep across the band***. Thank you Eton. *** See the caveat, below. The Eton Traveler 3's sensitivity is to be commended. Of all the ultralight DSP radios I own or have tried, it is the most sensitive one of all. In western Arizona, Los Angeles' KFI-640 (50 KW), at 217 miles distant, is armchair copy. The only other radio which offers a presentable signal, though weaker, is the Tecsun PL-380, another Si473x DSP radio. On the others, audio is strained or non-existent. No signal is even present on the Sangean DT-400W. The Sony SRF-59 struggles to even make it out. Selectivity is good. It appears to be about 3 KHz wide, or possibly even 2 KHz, about equivalent to the Tecsun PL-380's 2 or 3 KHz setting. And of course the skirts are steep, using DSP technology. The only thing lacking is a way to set different bandwidths like the PL-380 can. That's not objectionable to me, though. A nice and welcome software correction, the radio's display now updates signal strength (RSSI) and signal-to-noise values approximately three times per second. The Tecsun PL-380 only updated its display about once every two seconds. It's much easier to rotate the radio now and read the signal strength changes in somewhat realtime. Eton, you skimped on the tuning encoder. It's cheap, and mechanical, though a mechanical encoder would be what is expected in a radio of this price range. Tune upwards very slowly, like DXers do, and it skips two channels over, or tunes backwards a channel. Tune downwards slowly, same thing. Unacceptable. Mine isn't the only one, either. Reports are that many, if not most, act this way. One solution is to change the tuning step to 1 KHz which makes the channel skipping effect less noticeable. But it takes forever to get anywhere at 1 KHz without a keypad. Fast tuning, activated by spinning the tuning knob many, many times, doesn't kick in quite soon enough. A little history. Automatic Gain Control, or AGC, was first implemented in radios many years ago for the reason of fading propagation, which required continuing manual adjustments of the receiver’s gain. The idea is that the AGC circuit will automatically maintain a constant signal level at the output, regardless of the signal’s variations at the input of the system. Besides the depth of its interaction, AGC has two other characteristics, attack rate and decay rate. The attack rate is the speed in which the AGC is applied, the decay rate is the speed in which it is relaxed. All three are important design considerations. ***I find the Eton's AGC to be a bit heavy handed. It's decay rate is extremely slow in reaction, especially for the DXer. Tune off a moderate or strong signal to a nearby weak one, and it seems seconds before the AGC relaxes and brings up the volume of the low level background signal and attended atmospheric noise. This is simply a programmatic adjustment on the DSP chip. It probably works for the intended consumer crowd, but not for the DXer. I prefer a relatively fast-reacting AGC. Now, for the LCD display. Use this radio indoors, if possible. The orange digits on a deep black background are beautiful to behold in a dark or dimly-lit room. Take the radio outside, particularly on a sunny day and you think you have gone blind because the display disappears. You can't see the digits. The display also has an odd "best" viewing angle. It appears to be around 45 degrees, looking up at it from the bottom of the radio, not dead on. And that angle is not forgiving in the sunlight, either. A few degrees off and the display disappears again. You are constantly adjusting the viewing angle straining to read the information. In summation, I found the Eton Traveler 3 to be a good buy at the price I paid. It has marvelous sensitivity for such a small unit. Except for the deficient tuning encoder, it tunes smoothly, nearly as good as the old analogs did. Soft mute has finally been eliminated. I could never understand why you would combine AGC with soft mute. One intends to increase the receiver gain so you can hear weak signals and the other masks the receiver output for weak signals. They are mutually-exclusive. Maybe the Eton Traveler 4 will have tweaked AGC, a better tuning encoder, and a brighter display? One last thing, the Eton Traveler 3 looks highly modifiable. It's ferrite loopstick is easily removed, allowing for experimentation. More to come on that! I was just looking on Amazon, and the Traveler III is currently available for $38.05 shipped, not including sales tax. I'm ordering one tonight. Fry's also has them, but they're $70, and based on my past experience, I don't think it's worth over $45 or so. Hopefully I'll get set the Grundig Edition, and hopefully it'll be better as for usability. :) (The one I had previously, from Fry's, wasn't the G.E.) With tax for me it's $41.09, and they estimate I'll get it between the 15th to 20th. Also, any idea when the next set of maps would be posted, and what updates/features would be new from the previous edition? I have another suggestion for the maps, too. It seems like it's a long time between map updates, and inevitably some stations may change their callsigns in the meantime. This makes it a bit more difficult to look up said stations, cause you go look up one callsign on FCC search and it comes up empty. My suggestion would be to also put the Facility ID on the popup (that shows the callsign, city of license, power and number of towers) on the maps. Also, would it be possible to come up with a San Diego based map for 1390, that shows the "contour(s)" where KLTX and XEKT have an equal-strength (or within 1-2 dB or so) in the daytime? In lieu of that, maybe a map that shows multiple contours of both stations so I could make an "educated" guess? I should note that XEKT's transmitter power is 5 kW according to what I remember them announcing on the air, and I believe they use the more southwesterly site (that's a little southwest of the town of Tecate, near a highway interchange). (I believe the FCC data says 1 kW on 1380.) Also XEKT is supposedly a station that's moving to FM - they're also on 88.5, so I don't know how much longer 1390 would be on the air. but I would like to improve on that if possible, including tricks like using my GE Superradio III, a Select-A-Tenna, utility longwire, etc. (Also it'd be better to make the recording in summer - I did the recording above a couple Decembers or so ago - to reduce the chance of skywave, but I also think with it being that strong near noon it's likely also like that in mid-summer.) If I could redo it with a sensitive enough setup so it's like a noise-free signal (almost like what you get from WHAM in NY, for example, except for the co-channel interference), I think that'd be great. We are on same wavelength. Was wondering what you have been up to lately. $38 is a pretty good deal on the Traveler III. The one I bought was at a closing Radio Shack store last spring and went for $45. That's about all they are worth. They are sensitive but the thumbwheel/encoder is very cheap. I can't imagine it lasting more than five years. And I find the display horrible in any kind of daylight. Let me know how it works for you. I'm getting ready to post a whole new set of pattern maps for 2016. I may map three different signal strengths for daytime/critical. For nighttime (skywave), just one or two. It will definitely make the download a lot bigger. Skywave is greatly enhanced this year and much more accurate. Daytime/critical about the same. No other enhancements have been made. I'll look into putting the facility ID on the popup, that may be a pretty simple change. Otherwise it's about a done deal at this point. I'll work you up a map for KLTX and XEKT. By the way, the current FCC records for XEKT-1380 shows them at 250 watts daytime/100 watts nighttime. I don't even see them listed in the official Mexican .PDF. I'll check a second time just to be sure. There is an XEKT1-1380 at 1 KW (FCC record), but that is a much older record. I don't see any FCC listing for 5 KW. Let me know which one to plot. Waiting for warmer weather here. It's been cold. Actually, I see a fairly current record for XEKT for 10 KW (one record older the newest one). It is at the western site and has two towers. It has a cardoid pattern to the south. Maybe they are using 5 KW now?? I was reading in a review somewhere, either on Amazon or someplace, that the display may be improved a little, I don't remember now. I'm hoping it's better than my other one was in that and other areas, and even if not, I think $38 is more reasonable than $70. Hey I was thinking of something - would it be possible to put the critical hours (and maybe others where applicable like specified hours, PSRA/PSSA, etc. if you're doing those) in different map files? I'm thinking daytime in one, nighttime in the second and the rest in the third maybe. AppID 310456 = 0.25kW day, 0.1kW night, ND1, 32,31,45 N 116,41,32 W.
AppID 1012979 = 10kW day, 0.5kW night, DA2, 32,31,45 N 116,41,32 W.
AppID 1103958 = 0.25kW day, 0.1kW night, ND1, 32,34,0 N 116,37,0 W.
Under FacID 115306, there's just AppID 411307, with 1kW ND day and night, from the southwesterly site. I looked on Google Maps, and on street view from several angles at the more southwesterly site, and I only see one tower. I saw no tower on street view looking at the other site. They're still the same signal strength they've always been, so I think they're currently operating with 5 kW from that one tower. Which would be easier, to manually specify that station as running 5 kW from the southwest location, or, in the map, to do some multiplication of the shown contour values? (calculating: 0.05*sqrt(5/1)) = 0.1118 mV/m. Yesterday I went to San Ysidro and found a spot (approx. 32.568301, -117.067326) where WNSB415 and XEUT were about equal strength. On my PL-606 they were each registering about 74 or 75 dBµ. I made a video comparing them on the PL-606, SRF-59, SRF-M37W, Superradio III and CC Pocket. I don't remember if it was in that order, and I still have some editing to do on the video before I upload it. I'd guess it's a weee bit colder than it was when I was there? :) I remember when I went there, I was actually more comfortable there than at home, even though it was almost 25 degrees warmer in Quartzsite. I think there might have been thunderstorm activity near San Diego area around that time, which significantly spiked up the humidity here. First, apparently I miscalculated, the difference between 1 kW and 5 kW is about 6.9882 dB, not 6.02 dB. The 5 kW vs 0.25 kW difference is still accurate, at 13.0102 dB. I'm working on more of a comment, but thought I should at least post that one correction right away. Yes, I've already decided to split out the critical hours patterns into a different map/folder. PSRA and PSSA are not possible to plot because they don't have unique (or any) engineering records to work off of. I put some changes in a couple of months ago allowing me to modify station power before generating the plot. It's a tedious method, but I can change XEKT to 5 KW. The only records I have for XESDD show 3 or 4 towers. I can't plot a single tower for it. 1620 WNSB415??? Sorry, I don't know what you mean here. Yes, the difference between 5 KW and 1 KW is exactly -6.98917000 so you were very close. Splitting the Crits out will help I'm sure. There were a few occasions when I saw them on the existing maps and it looked like it could easily be confusing, or at least cluttering. Speaking of radio-locator, one thing I was thinking for your maps if you wanted to trim the size down... is maybe consider not including the same groundwave contours that radio-locator uses (2.5, 0.5 and 0.15 mV/m) on the main all-maps download, or at least on the light version if you put 2 versions up. WNSB415 is a Traveler's Info station. I forget what rule they're under or what part of the database (I think I have to go somewhere that's similar to the amateur licenses search, I forget - although there used to be a link from the fcc am query to where to search them), but they're usually up to 10 watts with a 15 meter antenna, or I think 2 mV/m at 1 km, but I forget what the specs on field strength are. The radio-locator figures of 2.5, 0.5, and 0.15 mV/m are pretty well ideal values. The fringe value, 0.15, is just about the threshold where patterns start to overlap, a good choice for a map. The other two, 0.5 (distant but acceptable copy) and 2.5 (local strength) give a good indication of where you can expect these signal levels to fall off when mapped. They are well chosen by radio-locator, which is why I've used them. Skywave is a different animal of course, and actually the strength varies by distance in odd ways. For example, generally the strongest signal out of most stations is in the 200-300 kilometer range, and there may be bumps anywhere along the line depending on vertical take-off angle bumps in the pattern. Extreme fringe 0.05 mV/m plots are very interesting (I'm talking for daytime propagation), as they reveal the extreme outer extent of possible coverage on a very sensitive receiver, or one which has been enhanced by a loop. I have received stations clear down to 0.02 mV/m or so on good days. I kind of thought WNSB415 might be a TIS station. Unfortunately, the FCC doesn't document any engineering data for this type of station. I have a way of modifying tower spacing and phasing, but it is a direct modification of the record itself and not very user-friendly or error-forgiving. Tedious, as I said. Yes, it has been a mite chilly here since December, and a whole lot colder than when you did your DX trip last summer. Are you headed out this way any time soon? Ahh, okay. :) I was thinking something like the 0.02 mV/m contour you mentioned receiving would be interesting to see for the ultra-fringe, and for local, something like 10 or 20 mV/m. Then an in-between, if only choosing 3 contours, might be something like 1 mV/m, where some radios may or may not light a tuning indicator, stop a scan, etc, and some of the cheapest portables might be getting weak. I do wish TIS stations were more documented. And I was wondering if it wasn't all that easy to modify plot data. Also I was wondering, are you able to get XEKT there in Quartzsite on your radios? Based on looking at my videos again from my last trip, I'm guessing you'd need loop assist. I got no signal on my car radio in Quartzsite, but something weak was in at Riley's Well rest area just west of Blythe. Also in Quartzsite, the Superadio III had a faint signal of something on 1390, presumably XEKT (unless KLTX would reach there? ), but too weak to ID. In a third video on the car radio, about halfway between Salton Sea and Borrego Springs on Borrego Salton Seaway, XEKT had respectable signal on the car radio (showing 1 bar out of 4; note that in many cases stations are still easy copy with 0 bars showing). I'll play around with the plot values a bit. The 1.0 mV/m level would be a good choice, as you say, for us mediumwave DXers. Perhaps 1.0, 0.15, and 0.05. Or maybe even just 1.0 and 0.05, or 1.0 and 0.1. I can't go too low because of severe overlap on some channels (like graveyard freqs for one), though I could do graveyard separately. Many stations populate the freqs above 1000 KHz and it starts to present a problem with overlap and sheer data. With entering data for TIS stations, the problem is the unknown antenna. The formulas aren't made for the tiny or non-standard antennas they tend to use. Efficiency of these radiators is horrible too. Took a ride this afternoon and tried for XEKT-1390 with the Traveler III and direct-connected 12 inch loop. I hear a faint Spanish station under the splatter of local KLPZ-1380, Parker, AZ (2.5 KW, and about 35 miles north of me). Given a long enough time I might have been able to identify it. I should have taken the 24 inch loop instead of the smaller one. Your KLTX-1390 and XEKT-1390 stations are nearly exactly 180 degrees apart at your location. Too bad you can't null one away. Would it be possible to have checkboxes to turn various contours on/off? I'm thinking at least have them on the top bar so you can turn all of a particular contour on or off. I'd also be nice if you could have them on each individual station flag's popup as well - for those it would be just turn the station on or off. (Individual contour selection there would be nice but I'm guessing it would greatly complicate things.) Then at the top there would also be a checkbox to turn on/off all stations, useful for if you've manually selected or de-selected several individual ones and want to show all stations, or show none then select the individual one you want to see. And as for a ultra-local signal contour, how high would be too much? I'm guessing the 614 volts/meter (the fcc exposure limit in most of the band except the upper few hundred kHz) would be impractical/inaccurate with your plotting method, as that field is reached maybe 30-40 feet or so from a 50kW station's tower. (For example, if you look at KNX's tower in Columbia Park in Torrance, CA, I believe that contour is contained entirely within the fenced area that the tower is in.) Maybe even 1 V/m (the blanketing contour) would be too much, but what about maybe 100 mV/m, or 15 mV/m or something like those? At my house, XEKT pretty much owns the channel during the day. It isn't until I head west toward the coast that KLTX appears. On correcting Mexican data... I need to avoid ongoing maintenance. When I make the yearly plot set I load the current FCC database up, pull obvious duplicates and errors and make the plot run. I don't keep an ongoing, modified database. When I want an updated database, I simply download a new one from the FCC site. I know there are some guys that maintain a Mexican list, which needs periodic attention. Not something I want to get into. At my age I have other things in life I'd rather do. Just being honest. You're right, the standard FCC formulas will not work for anything closer than 1 kilometer. Close-in OSHA levels are basically estimates anyway. I don't think those formulas are super accurate. And directionality modifiers, well, you can kind of throw them out the window when you are 50 feet from a 50 KW multi-towered array. I can understand keeping the Mexican list updated would be tedious. :) I do wish the Mexican FCC equivalent would keep more up to date on it, same with the Canadian FCC equivalent, or wherever the FCC is sourcing their international records from. Yes, propagation over salt water covers amazing distances compared to, let's say, an 8 mS/m ground conductivity. I have taken the high powered stations along the west coast as a group and projected them out into the Pacific, and it's amazing how far the signals reach during daytime hours. I wish some of the Asian countries had engineering data available on their transmitter sites. It would be fun to project their signal strengths this way, back toward us. I have a way to modify the tower records on a temporary, per run, basis. You've got to have an FCC record layout in front of you to know what to change. Will send you a WQAM daytime plot. Yes, saltwater propagation is interesting. I'm also wondering if maybe there could be something else at play as well when talking about very weak signals and very sensitive receiving setups. Is it possible that daytime skywave can work even at solar maximum at noon on the summer solstice, with a sensitive enough setup and a low enough noise environment? I found the WQAM in Newfoundland post. Search the page for "I was able to clearly copy WQAM". I wonder what the field strength might have been there? Or is it possible something was enhancing it beyond just the theoretical groundwave? And speaking of weak signals, I've often wondered what the absolute limit, in µV/m (or if applicable, nanovolts/meter), of detectability of mediumwave BCB signals, in the lowest noise (naturally-occuring above ground, not in a screen room) environment, using QRSS CW or PSK31 modes. For example, what about situations like this one? Another example, by the same artist but in a different song, are the phrases "push me away" and "we're slowly fading away". After 1:43 and the phrase "we're slowly fading away", going into the 2nd verse, KDIS does their day to night pattern change, dropping the signal out completely, then returning with a greatly reduced signal strength. Also through the rest of the song I hear skywave fading as well. Is it possible to put the layers showing political boundaries (countries, states, counties, cities) and roads & highways, both depending on zoom level, as the top layers? I'd suggest roads on top, then boundaries, then contours and shading, then terrain/satellite/other. Is something like that possible to do? I think it could help make some maps, like GYs, etc, more readable, maybe. I'm not totally settled on the plot levels yet. The 1 mV/m and 0.02 mV/m (or maybe 1 mV/m and 0.05 mV/m) levels I will probably go with. And maybe 1, 0.15, and 0.05. A local level of 25 mV/m, that's actually very much what I would consider an "urban" level. However, it's just a terminology difference. The 25 mV/m signal level occurs out at about 30 miles from a 50 KW station, and only about 6 miles from a 1 KW station, where both are at the lower end of the band... and less distance at the higher end. 10 mV/m might be a another choice as you said, or even 5 mV/m. However, four plots per station is just a bit much. Even three might be too much. They'll run on a desktop without much problem, but will choke a tablet. And I know some people use these plots on tablets. I'll play some more with it. Switching plots on and off won't change the "choke" factor. All those thousands of lines of HTML still have to be there. And it'll have to be just one plot run. I don't want to have to maintain two versions, one for desktops and one for tablets. I'll find a compromise. Nighttime skywave... at less than about 40 miles, the standard formulas fail because the signal levels are so insignificant. So in a way there is no "local", in terms of distance anyway. Best signals usually occur at about the 100-250 mile distance, these I would consider at "local" or even urban level. Past 250 miles, the signal drops pretty much logarithmically. On the previous plot set I think I chose 0.25 mV/m for skywave. This value was a good choice because it doesn't cause much plot overlap. A 0.5 mV/m level plot for skywave isn't a good choice because a typical sub 1 KW station may never develop a signal of that magnitude at all, anywhere, at any distance, 50% of the time. For example, little omni-directional 1 kilowatt KAAA-1230 in Kingman, AZ only barely reaches a peak of 0.3 mV/m at the 120 mile distance mark at 50% of the time. For the 10% time, it reaches 0.6 mV/m at the same distance. I'll play with the possibility of including the 10% value, making two plots. A patterned array, at less than 1 KW power will have too many dropouts at various points of the compass (where there is no signal ever reaching the 0.5 mV/m level, and even 0.25 mV/m level sometimes). Though people have made Google maps with layer types as you suggest, the political boundaries (countries, states, counties, cities) and roads & highways are not layered on the standard Google map, but are part of the graphic itself that you see. So, there is no separating them. The flags and plot lines with semi-transparent plot fill just sit on top of the map. Ahh, I look forward to the new sets of plots. :) How difficult would it be to split the more crowded frequencies into multiple files per frequency? I'm thinking although the overall download would still be pretty large, hopefully loading each individual file would be easier. It still leaves how to split them, though, like if stations are spaced closer than X then make multiple splits, or divide the map area into sections, etc. Also for nighttime, weren't you using groundwave for close-in calculations, and/or in situations where there wasn't much skywave to speak of, for example the stations with 1-watt night authorizations? Hmm, maybe it works differently than Google Earth, then, I thought I had remembered being able to turn those on and off individually. But even so maybe that's not like Photoshop/Gimp, where you can raise/lower layers at will. Back to a previous question, yes, daytime skywave does exist. It seems to be particularly evident (naturally) at winter solstice when the days are the shortest. Technical journals claim winter skywave during daytime hours may only be some 30 dB less than the nighttime signal strength. I went to Denver for Christmas and on the wayback I jeard KFI-640 in Trinidad, Colorado in late morning and extreme through northern New Mexico over the noon hour. This is a distance of 785-795 miles, where an expected groundwave signal strength is only about 0.00085 mV/m calculated by formula. Basically that is so far below the noise level that it would not be receivable. I feel it had to be skywave. This may be what I was hearing last Spring when I followed KFI-640 from Flagstaff nearly into into Albuquerque during mid-day. I'll have a quick look into splitting the more crowded frequencies. I sure don't want to do it manually. But, it does help to have everything on one map to see the relationships between stations. I don't remember if I used groundwave substitution for close in signal levels on the nighttime plots. I normally do that. It is necessary to do that for lower powered stations, and also for arrays with deep null patterns which effectively have almost no signal in certain directions. And there are many, many of them, even the high powered stations can cause trouble here. I'll look into the software changes for a week, then make the plots, whether the software changes are finished or not. Checkboxes are still up in the air. They are difficult and I'm not sure I can make it work. So, let's say by the 25th. Automated changes to split channels with many stations will be another time consumer. Correct, the other hobbies are not related to radio. More on that in a future discussion! I took the 3 radios from Fry's back today - the Naxa, GPX and Sangean. I may yet buy the Sangean again, but I wasn't sure that I'd have much opportunity to give it further testing, and there were a few things that I thought were a little deficient, like weakened sensitivity at the ends of the band, and strong stations bleeding halfway across the dial, at least when I put my Select-A-Tenna tuned to 760 or 1170 on it. The Naxa, as I mentioned already, was dead. Although ... I was able to get 1170-KCBQ on it, by going right outside their transmitter site and using the Select-A-Tenna + utility groundwire. (With the same setup, on the Traveler III, it indicates 99/99.) I happened to be there at the time of pattern change, and after KCBQ went to night mode, it was no longer receivable at all on the Naxa. The GPX has some kind of digital chirp chirp chirp sound on weak signals, like it's trying to refresh a dsp signal strength display twice a second (a function the radio doesn't have). Also I recorded a short video this morning at Sunset Cliffs area of 1390 on the Traveler III and Superradio III - location was 32.719077, -117.254604. At that location, KLTX was noticeably stronger. (They're the station airing the Spanish version of the hymn "How Great Thou Art.") I'm thinking I might like to try again at another spot, like maybe Shelter Island, or Coronado Island somewhere. Do you remember which station it was near New Orleans that had the perfect cardioid pattern? I wonder how it actually performs in the real world - for example could you stand on the transmitter site property with a beverage antenna on the "wrong" side of the pattern and not hear them at all? Yes, I would think a signal of that huge magnitude might penetrate through just about anything! Thanks for the report on the three radios. Interesting, and curious one was DOA. I hate the quality of these "cheap" sets anymore. And they aren't so cheap anymore, either! I understand the newest Degen 1103s have incorporated a DSP chip. I loved that radio, but mine went south on me with software glitches. If this new one is good I might pick one up. Have you heard any news? Great on the 1390 recording! I envy you being at the beach. Yes, I can change a station's power prior to the mapping, but again, it's a record hacking process. Not user-friendly at all. You wouldn't want to do but one or two, just to test what happens to the pattern. The New Orleans station that had the perfect cardioid pattern was WORL-660 (nighttime). It crashed the program one time, so I had to put a check in for zero (or near zero) signal at the notch. It would be interesting to check that notch out. Much depends on the distance you are from the transmitter. The notch is due north and has almost no signal in that direction at low (ground) elevation angles. A lot of signal goes almost straight up into the air at a high angle. Good for very close-in nighttime coverage, but nothing at an appreciable distance north. I'm pretty good at backing up. I've only had one major disaster in my lifetime many years ago (very early 1980s, Radio Shack TRS-80). Don't laugh ;-) I lost months of work. That was a lesson to me. I even wrote a file recovery program because of it, and subsequently published an article about it in TRS-80 News, a national magazine at the time. Okay, nearly all of the past week has been spent coding, almost full time. I have the plot checkboxes in place. Turn plots on/off en-masse, or one at a time, no problem. Just click the station's flag and the box shows up. I incorporated splitting the plots into smaller groups (available only when being created in the program) but that might not even be necessary with the plot checkboxes now. I also did some other bug fixing. I have a few minor tweaks to make to the file naming process (for plots). I'll get the plot set together around the end of the week and try to post it over the weekend. I'll get you another plot map for KLTX+XEKT at those plot levels you asked about (in a day or two). Or, I can do different plot levels for each station. Let me know what levels for each if you want different ones. Yeah, I'm not too fond of their cheap quality either, for the most part. :/ Although, I am looking for a cheap, low-quality radio just for some experiments / fun / etc. I'd definitely want a digital readout (digitally tuned not entirely necessary, but it does need to be accurate to within about 1/10th the readout resolution - for example within 1 kHz if it has 10 khz display "steps", with an indicator that changes when I'm not within that 1/10th range). The selectivity would throw XEWW right out the window, though. What I'm looking for would hear KOGO, KFMB, KECR bleeding into each other (for example I'd hear KOGO under KFMB), and KCBQ would be audible across most of the band. I haven't heard anything about newer Degen radios, but then I haven't been following them all that closely. I looked at WORL, and the FCC doesn't quite go down to 0 on the chart (when you go to their detailed record and click the pattern data link) showing the field strengths. Maybe the divide by 0 error happens at some other point on the data? Also the FCC and radio-locator show that callsign (on 660 kHz) being a station near Orlando, FL. Alternately, if changing XEKT's power would be impractical ... (gonna go look at the chart you gave me a year ago real quick...) According to that chart, it shows XEKT1's signal at my location as 0.94802 mV/m. Therefore, for whatever contours you do for KLTX, I'm thinking do (*0.948/2.4) for XEKT1. For example, for the 1.0 mV/m KLTX contour, the corresponding XEKT1 contour would be 0.395 mV/m. Would it be possible to do 0.7, 0.85, 1, 1.2, 1.4 mV/m contours for KLTX, and 0.2765, 0.336, 0.395, 0.474 and 0.553 mV/m for XEKT1 if you have to use the default 1 kW for XEKT1? (Or maybe 5 or 7 plots, 1 dB apart, with the strongest one being one that just misses overlapping?) If you do modify XEKT1's transmitter power, I suggest also including the 2.4 mV/m contour so we can check that it's set up right, by seeing how close to my location it goes. Also I'd suggest setting the shading opacity quite low, like maybe 5% at most or something like that. Would it be possible to do radial spokes, like I think I saw on an older version of pattern plots? There's a pic on your blog post - http://radio-timetraveller.blogspot.com/2013/09/new-us-mediumwave-files-uploaded.html - that shows what I mean. Yes, I see WORL-660 is at Altamonte Springs, Florida. I thought the station was near New Orleans too, but WORL was the one in my notes (that had the zero divide problem). It was in the LOG10 function. A Log of zero creates an error of course. "Any chance it could be possible to calculate/estimate what the field strength would be where that bird is sitting? :) (that's one of KOGO's towers.)" The OSHA formulas might get close. Ever get an RF burn by touching an antenna? I did that once in my early Ham career, with a transmitter running only about 40 watts. It is a shock that is quite painful for hours and even days afterwards. I don't have that much to back up anymore. A few software programs, an occasional picture. I use a 32 GB flash drive which I leave plugged into a USB port at all times. When I want to back up a file or files, I simply drag them over to the flash drive. Simple for me. Ha, 10 plots. Surely you're joking :-)) I'm creating the nighttime/unlimited plot set as I write. I did the daytime/unlimited plots yesterday. Two plots each, 1.0 mV/m and 0.1 mVm. Two+ hours of processing on an I-7. Almost 10,000 plots total. Each one takes a second, give or take. The nighttime set may run about an hour or so. One plot at 0.20 mV/m. 10 plots would take approximately 13 hours, and that's just the daytime/unlimited set. I'll check on the XEKT plot when I get some time. It's easy to just change the power level. I've been busy running the 2016 plot set (and trying to weed out duplicates, etc.). It's time consuming. Damn FCC. I wrote to the FCC's database guy some time ago and asked if they were interested in the database errors I had accumulated. He said yes but it might take some time to analyze. I spent about a week getting the stuff together and emailed it off. Mostly technical errors and bad data. I could give them a bunch of duplicates and records that need to be archived too. I bet it never gets looked at. Not so far, anyway. I haven't done the radial spokes on the plots, considering the 2016 signal levels and some overlap involved. It seems too confusing now. Plot opacity is set at 22%. I might have gone a fraction lower but it looks okay. I'm getting a fair amount of overlap on the nighttime plots at 0.20 mV/m. The saving grace is that they can be turned off and then you can plot individually. The lower plot levels give a better idea of where a station can be heard. 0.25 mV/m, believe it or not, is quite a bit shorter distance with less overlap. Nighttime plots are misleading anyway. Signal strengths vary in a non-linear fashion over distance (unlike groundwave). At 150 km you might have less signal level than at 200 km. I'll look at the set again when I'm done building it. Haha, yes, I was at least somewhat joking about the 10 plots. :) I look forward to seeing the new plots. Although I might have liked to see a somewhat lower field for the low-signal daytime plot, like 25 µV/m or whatever would be identifiable with some difficulty in a remote area on a fairly large loop, and maybe also a 20 mV/m strong signal field. :) I figure it's done already, though. Ahh, in that case re: XEKT, it'd probably be best to just change the power. :) I suggest before you send it to me, set it to, say, 5 kW, then check what the field would be at my location. (They've ID'd as 5 kW in the past, although I haven't heard them mention power since they got the FM simulcast but the signal is still the same level.) If it's considerably below about 2.4 mV/m or so I think (like maybe 1.5 mV/m or so), then try 6 or 7 kW. They should be approximately within 0-1 dB or so of KCEO's daytime groundwave signal at my location, based on what their signal strengths indicate on my Traveler III. The WORL-660 error was some sort of error in the distance computation. The Log function is used against the distance calculated at points in the theoretical pattern (which is perfect). At one point the distance was 0. Result = error. The CPU here is an I-7 4500U, on a laptop. 8 GB memory. I have an NVIDIA GT745M card in it. ASUS. Played with opacity on the plots. 10-22% is optimal. But a lot depends on the color used. At 5% you really can't see it well enough. A dark grey at about 18% works pretty well overall. Had trouble with certain color combinations. They don't always fit together well. But they are available anyway. You better be careful around radio towers. They will kill you! RF burns are not just burns, they are big-time electrical shocks too. You would not survive touching a tower. And if a guy wire has an insulator failure, through mechanical failure, moisture, etc., it's the same as touching the tower. Dead! It only takes milliamps through your heart to stop it. FCC corrections: a bunch of Baja stations that were noted as BC (British Columbia). Two Florida stations that had old records nowhere near their current transmitter sites (I think it was WFTL and WRHC). About 15 technical errors in tower data (all US data). A couple of records that had been prematurely archived (US). There's no reason to correct other Mexican data. They don't care anyway about stations outside the US. Look at XEKT-1390. All FCC records still show it on 1380. This international handshaking of information on radio is a farce. Ahh, I'm guessing there must be some other things at play that make it not as much of a notch, for example having the 0.2 mV/m night contour farther north than the north end of where Google Maps says Charles St ends. (Zoom in on the marker and you may see what I mean.) :) Speaking of odd patterns, I've sometimes wondered if it's possible for a pattern to have a sudden change on one bearing vs another, and I mean much more so than what the ground conductivity in Mexico vs CA makes KBLU look like. :) For example, let's say you're 100 miles from the station, and there's no saltwater path. Could there be a notch so that if you hold two radios out at arms length (like Jesus on the cross), have one radio get an almost full-quieting local-grade signal, and the other (same make & model) not have any signal at all? Assume you're looking toward the transmitter site. I've already mentioned what CPUs I have in both my PCs. I have 8GB of memory in the laptop and 32GB in the desktop. (The desktop is maxed, the laptop can take up to 64.) The laptop has a GTX 970M graphics card that's upgradeable, and the desktop currently uses integrated graphics. (I'm for now waiting on the next generation of both NVIDIA and AMD GPUs to see what they're like. I may also consider getting a GTX 750 Ti in the meantime, as I've been having graphics driver issues, crashes, etc. now and then in games. The laptop is essentially a Clevo barebones plus some parts I added, and the desktop was one I built myself. Yes, I am usually careful. :) I don't go inside the fence immediately surrounding the tower, and the only time I would do that would be under supervision of an on-site engineer. Thanks for the tip about guy wires. (If I was to hold a radio a few meters from the guy wire and it overloads badly, but the overload lessens as I move away from the guy and closer to the tower, would that mean the guy wire is hot?) And I've seen that video. Sounds like he got himself an RF burn too, "OUCH!" (Also I think I've heard stories of people running, then jumping onto a hot tower to climb it, jumping so that they weren't touching ground and the live tower at the same time. I definitely don't see myself foolish enough to attempt such a stunt!) I have seen something, maybe in the FCC info, about climbing hot towers if you lower the power sufficiently enough, something like 10-250 watts or so depending on frequency, tower height and whether you're wearing gloves. I suppose with a directional array the station maybe could de-energize the tower that's being climbed. And I've also heard of towers that you can safely stand next to, like maybe shunt-fed or center-fed but I don't remember if KFBK is one of those. I saw something like that on Scott Fybush's site some time ago ... http://www.fybush.com/sites/2007/site-070223.html. Also on his site featuring KFBK - http://www.fybush.com/sites/2005/site-051028.html - there's a picture of, I'm guessing the chief engineer, standing pretty close to a tower. Speaking of Franklins, one of these days I'd like to learn how multi-segmented Franklins and their efficiency would theoretically compare with multi-bay FM antennas. I'm still considering a west AZ desert trip in the near future. :) There's a chance I may want to do it the first week of February, but I don't know yet. (I think I may be starting to get some bug, and if so I likely wouldn't be over it by then so I wouldn't. Otherwise, probably more toward late February or into March or later, I'm not sure yet.) It's about a 3+1/2 hour drive or so from my location out I-8, up 115 to catch 78 then over I-10 to the KBUX-FM site. "I've sometimes wondered if it's possible for a pattern to have a sudden change on one bearing vs another, and I mean much more so than what the ground conductivity in Mexico vs CA makes KBLU look like. :) For example, let's say you're 100 miles from the station, and there's no saltwater path. Could there be a notch so that if you hold two radios out at arms length (like Jesus on the cross), have one radio get an almost full-quieting local-grade signal, and the other (same make & model) not have any signal at all? Assume you're looking toward the transmitter site." In a word, no. Transition changes are gradual in the real world. That's also tru of changes in ground condustivity. The FCC M3 map only has hard edges between conductivities. That's not true in the real world either. But, that what we have to work with. Strictly defined, a Franklin antenna is two half wave segments, making a full wave height in all. It has a very low angle of radiation, which is why it's so effective on groundwave. That article seems to indicate they are fed a little differently for the broadcast band (it said they were fed from both the bottom and center of the tower). In the Ham radio world, a Franklin (many times in the horizontal configuration), is generally fed at the middle only. A 9 segmented vertical is a different animal altogether. Now you have a driven, multi-phased collinear vertical, with necessary phasing stubs between each section to keep each radiator phased correctly. It's possible in reality, but not possible to compute using the standard FCC formulas which are used on the database. There would be no way to define it per their data structure, as they only allow for up to two segments, not counting any possible loaded sections. Yes, I would imagine that the FCC's erroneous data showing XEKT still on 1380 confuses some applicants for 1400, thinking there is nothing on 1390 at that location. I left KXOL-1660 (DKXOL) in there just in case it's still on the air. Last I heard it was last Fall. The FCC just uses the "D" to signify "Deleted".